student movement? Where is one to speak of? Okay, I know I am about to embark on a very controversial exercise now. I am going to criticize the student “movement” in West Bengal and in particular, Kolkata. The reason I have put the word movement in quotes must already be abundantly clear from my title. I don’t believe that there is one to speak of in the state at present. So why am I writing about something that I don’t believe even exists in the first place? Well, because many seem to think it does. I want to challenge this notion, and hope that some of them [not all, excluding some I find precariously inclined towards the reactionary side and on whom I will be speaking of shortly] will consider this opinion and start pulling up their socks. What is the nature of the student’s organizations in West Bengal? It is and has been dominated by the ruling party’s student’s body, of course. For 34 years, CPM’s misrule was significantly aided by its student and youth wings, SFI and DYFI, by not only carrying out hooliganism in college and school campuses, but also by totally destroying any culture of building student consciousness through ideology and political education. Thus CPM and its reactionary, revisionist and blatantly corrupt, bourgeoisie-appeasing politics must be blamed for creating the totally reactionary nature of the student masses. But they are not the ones to be blamed of course. The 1960’s and 70’s saw for a brief period the rise of revolutionary fervor, inspired by massive peasant uprisings in several parts of Bengal and other states. That of course led to the formation of some staunchly leftist [however much we may agree or disagree with their line of revolution etc, but their dedication cannot be denied] student organizations. However, with the administration cracking down upon the student organizations as well as the naxalite parties/groups, they started to dismantle. Moreover, the waning of the peasant movement and the rise of factionalism and ideological and personal disputes led to the groups breaking down into smaller and smaller capsules, their activities reducing practically to nominal and insignificant activities, like maintaining some magazines and presence of just a few students in Kolkata or in districts. Such has been the background of student politics here. Not many on the “radical left” will dispute these facts. But we need to go a bit deeper. 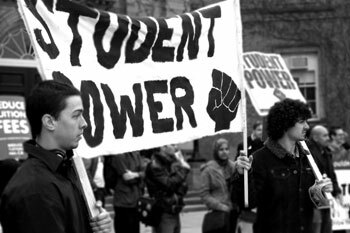 How and where do these radical student organizations operate? What is the relationship among them? Starting with the last point, they do not generally represent any form of convergence, but are largely antagonistic and only show a formal “unity” on the basis of certain programs. The general culture of political practice is pretty abhorrent – it is basically one of “recruiting” students. Every year, the freshers will be targeted by these groups and they compete among each other to win over these students. There wouldn’t have been a problem with this also – as long as this would have been limited to a competition based on ideology. However, in reality, what happens is a dirty game of spreading misinformation and outright lies about other organization, belittling them and basically ensuring that their image is a rather negative one in the eyes of the students. This is something that is practiced by nearly every organization, it may only vary in degree. To add to that, student politics in Kolkata, or rather that of the radical left is almost entirely focused on the two premier institutions – Jadavpur University and Presidency University. There is some activity in other elite institutions like the medical colleges and ISI, but in general, there is practically no presence to speak of, of these radical organizations. Additionally, most of these student organizations seem to carry the burden of the disputes that the senior gentlemen who influence these groups. So basically if you belong to X which is under the influence of a mother organization A, you will be inheriting the bitterness towards Y which is under B, because the leaders of A and B share bitter relations. Some of this rivalry may be ideological, but the bitterness has almost always some personal history attached to it, much of which do the rounds in different versions, depending on who you hear them them. That is why even the genuinely leftist organizations also cannot seem to achieve the minimum level of unity that they should have achieved if the rivalry were merely ideological. Let’s come back to the two institutions where much of the attention seems to be given. There are forces active within these organizations and which are part of what is commonly referred to as the “third current” [i.e. those not aligned with the major mainstream political parties or their student orgs like Congress, BJP, Trinamool as well as the in-your-face fake left parties like CPM and CPI] who seem to suggest that “Presidency is revolution” and “Jadavpur is an idea”. Let us investigate these claims. a) ideology: While the ideology of the different groups vary depending on their mother orgs, it is nonetheless interesting to note the compromises they may reach within these two campuses. Anyone familiar with the discourse among students, parents and teachers in West Bengal will know the enormous elitism surrounding these two institutions. So it is not surprising that there will be truck loads of elitism in students of these universities. But surely, any genuinely progressive, radical and leftist student organization would identify this elitism as a huge problem. Elitism obscures clarity in thinking; it introduces another form of hierarchy and basically legitimizes the extreme disparities that the state wants to keep among institutions. it is in the interest of the state to create some “elite” institutions, like oases in the desert, from where lackeys and stooges will be created, and who will not only contribute well to the bourgeoisie production machinery but also pay lip service to the bourgeoisie justifications of the present exploitative order. We will see that some of the latest demands from these institutions or the mindsets behind the movements only corroborate such ideological corruption but worse still, compromise with such mindsets by the radical forces. b) Let us take up Presidency university first. Ever since the hoopla surrounding giving Presidency an autonomous university’s status began, the new government has been showering on it huge amounts of resources, both human and monetary, for it is to be deemed an institute of national importance. Not surprisingly, some elements have been constantly supporting this move, and indeed asking for more, not for once realizing how huge this disparity is going to become and how it serves the ruling machinery. The relationship between the state and this section of the students is quite clear – the state feeds them, they lap it up. Then take the case of Jadavpur university. Apart from some positive examples during the Nandigram and Singur movements, almost all “movements” have been entirely campus centric. That is because the only organizations existing in Jadavpur that have any discernible strengths are campus centric. But the outrageously reactionary line is apparent even from among sections of these organizations. Utterly elitist in nature, their claim that “Jadavpur is an idea” and Jadavpur is the only institution that offers resistance and others only compromise blah blah, flies straight in the face of truth – whether in the recent ragging related agitation or in the CET based agitation, the sole purpose of the movements inside the institution have been conservative, defensive – to protect the special status that this institution receives. Anybody who has any idea of colleges in West Bengal would know that a much more democratic space exists in Jadavpur university. Of course it is welcome that such a space does exist and whatever credit that should go to the “third front” student orgs, should be given. But to defend the special privileges is clearly visible when you see the students actually protesting against the rule than to get admission in post graduation in Jadavpur, another entrance test has to be given. This must not be confused with the general opposition to CET. The opposition was merely on the basis of protecting the totally unacceptable and elitist and above all opportunist mindset of ensuring that all the graduate level students get admission in the post grad without any opportunity to outsider students. Even during the ragging movement, there were sections which opposed giving punishment to ragging and though the demand was for reinvestigation [which was perfectly justified given the circumstances], there were slogans that openly declared that it was not a case of ragging – the slogans and demands therefore were contradictory. Besides, the general mood was clearly to belittle the offence of ragging in general. c) Therefore, it is no exaggeration to call the general slogan that “Jadavpur is an idea” and that it is the hotbed of student movements when in reality the masses are full of reactionary and elitist viewpoints, as reactionary only. The reality is this: that there is no student “movement”, in the revolutionary or even progressive sense, to speak of. This can be gauged from the fact that apart from some small [and often dubious] “victories” in the elite institutions, no major landslide victory has been achieved by the student community in recent times. Whether the temporary ban on elections or the continuing privatization of education, none of the onslaughts that concern the student masses at large has been won. Groups like PDSF, AISA, USDF, AIRSO each different in different ways are among the few ones currently with any possibility of opening up new spheres in this arena, but so far, their presence is rather limited. Even among them, due to the general reactionary nature of the student masses thanks to the bourgeoisie hegemony, there is a huge amount of elitism among individuals. But the bigger threat is from an unlikely source – from an extremely petty bourgeoisie, post modern and class collaborationist crappy trend that has gripped many students by appealing to precisely what forms the class nature of their politics – petty bourgeoisie sensibilities. But such reactionary forces are able to exist precisely because of the vacuum resulting from the absence of revolutionary forces. Without a candid confession and thorough challenge to this problem, there is little hope for rekindling the revolutionary student movement in West Bengal. This entry was posted in student movement and tagged airso, aisa, IC, jadavpur university, naxal, pdsf, presidency university, student movement, usdf on October 30, 2013 by kisholoy2017.